I have Ubuntu 12.04 LTS. This morning when I logged into my Ubuntu, after login screen the complete desktop was empty, the only operation I could perform is right-click and open terminal. And from login screen selecting Ubuntu 2D and that also didn't solve the problem. My laptop is Toshiba SA-60 onboard ATI graphic card with 1 GB RAM. Please tell me how to solve this problem. I don't want to reinstall Ubuntu as whenever I install a I/O error pops up, forget about that. I don't want to reinstall Ubuntu. Please help. Go to Desktop list item. 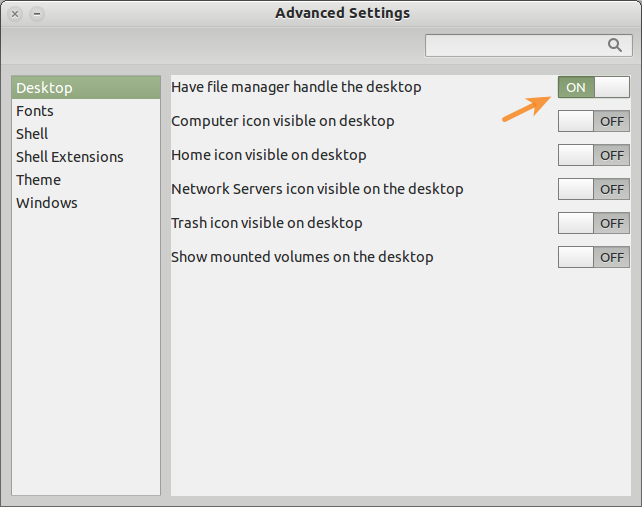 Make sure Have file manager handle the desktop is turned ON. The answer is kind of weird. Because you have tried the right things to reset unity. Press Alt+Ctrl+F1, login and then enter these commands one by one. Have you played with any config file, x org configuration last time? I have tried all the unity re-installs even going back to gnome. this took me 3 hours , but above command did the trick. My mistake was to tweak compiz, i know they give warnings ,but we run linux so what do you expect. Precise desktop wallpaper no icons or anything I was ready to reinstall ,but still i did like to know I am not a geek or a newbie but something in between. Not the answer you're looking for? Browse other questions tagged 12.04 unity or ask your own question. Unity's gone! How do I get it back?